Robin Wright’s performance in Netflix’s House of Cards is the real standout of the show – Spacey’s hammy Frank is a lot of fun, however it’s Wright’s multi-layered Claire that gives the series greater depth – but Wright has been a valuable player for House of Cards behind the camera as well as in front of it. So far she has directed seven of the show’s episodes, and whilst directing for ‘television’ generally involves more constraints than in films – Wright mentioned the show’s “regimented style” in her introduction to her short film’s premiere in Cannes – she has shown herself to be an adept director and particularly attuned to unspoken emotional drama between characters, as told through framing, blocking and so on. Wright is in Cannes with a short film, entitled The Dark of Night, which is very much a homage to film noir features of the forties and fifties, but with a few modern twists. The film opens with three people in a diner: a woman drinking coffee in a booth, a waitress and a man at the diner bar. The woman in the booth we quickly discover is something of a femme fatale, and all three have relationships that are far from obvious from the film’s opening moments. The Dark of Night is a film that relies on the unexpected and in this respect it works rather well as a short, with more twists in ten minutes than most films have in their entire running time. The Dark of Night is a film with more twists in ten minutes than most films have in their entire running time. The twists are perhaps a little silly, but The Dark of Night is a somewhat silly film – silly not necessarily being a pejorative here. Wright, working from a script by newcomer Denise Meyers, is clearly having a lot of fun, and The Dark of Night is an entertaining little diversion with a few moments that speak to ideas surrounding gender politics that rarely made their way into film noirs in the forties. This is the film’s primary diversion from tradition, but there’s also one expletive and moments of violence that are explicit in a more modern fashion. 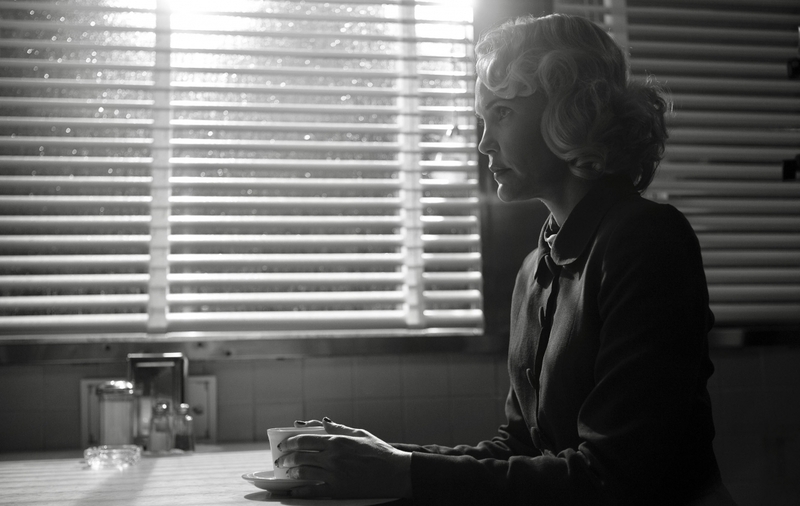 The filmmaking in Dark of Night is filled with nods to film noir in obvious ways – the short is in black and white and the light is frequently divided by blinds, for instance – and then there’s what Wright herself described as the “overly dramatic performance[s] and the way they talk[ed]”. There is the sense that Wright plucked a few things from films she admired too – some of the blocking suggests she may have been watching a Preminger noir or two. The Dark of Night is not exactly remarkable – a scene stealing performance from Sam Rockwell aside – but it’s a fun short from Wright that mostly works as it was no doubt intended to, and it will be certainly interesting to see if this new-found stretching of Wright’s wings will lead to a feature perhaps. Based on House of Cards and this short, it would certainly be an interesting prospect. This entry was posted in Reviews and tagged Drama, Mystery, Short on May 21, 2017 by Craig Skinner.